London Gatwick Airport in the UK has declared that it is trialling autonomous cars for moving staff around the airfield. The trial, which involves British autonomous vehicle software startup Oxbotica, “could lead to airfield transport needs being met from a much smaller pool of autonomous vehicles” rather than the traditional fleets of small vans. Workers will be “shuttled between popular locations” at the Sussex airport’s North and South Terminals in the electric driverless vehicles, which will only operate “airside” – the technical term for the parts of the airport where aeroplanes taxi around before and after takeoffs and landings. Oxbotica also thinks there are potentials for airside driverless wagons to take over such roles such as baggage transport vehicles, passenger load bridges (those tunnels you walk through from the terminal through the aircraft’s door) and even pushback tugs. A current tug (with a driver) pushes a plane backwards away from a gate at Schipol airport in Amsterdam, the Netherlands. 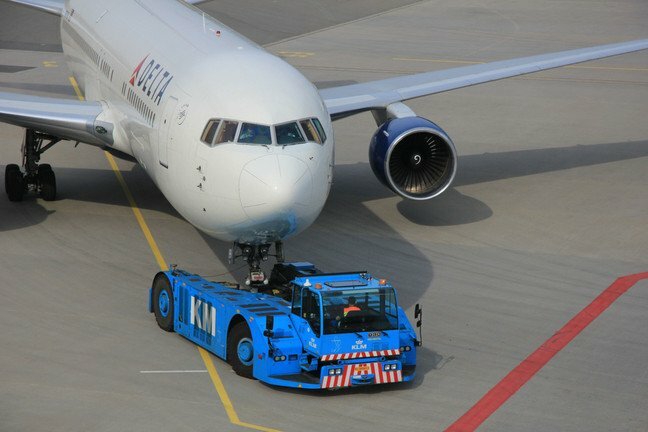 The latter would be an interesting role for driverless vehicles to take over, not least because airport tug drivers’ main duties around the world include talking to the aircraft’s pilots and visually confirming things such as all doors being closed and that ground equipment (generators, fuel lines, cargo trolleys etc.) has been removed to a safe distance before the aircraft leaves the gate – a safety critical function. The rest of the suggested roles are probably straightforward to automate, though baggage vehicles also tend to carry useful people like the baggage handlers, doubling up as a job-to-job shuttle as well as for moving passengers’ suitcases around. The International Air Transport Association is said to have identified 40 types of roles that driverless vehicles could fulfil. Also involved in the trial are Oxbotica’s insurers, XL Catlin, the Department for Transport and the Civil Aviation Authority.